Growing up in a loving home in the Bronx, not too far from the running routes she now frequents, Diana has fond memories of playing with her close-knit family including her 4 siblings and parents. She looks back on her childhood with a huge smile, in large part to her mother. Diana had a constant friend and cheerleader in her mother, who according to Diana, was telling her to “Just Do It” even before Nike coined the phrase. “She was the most inspiring person I know. She touched everyone’s life.” Diana took this support and ran with it as she headed to college at Northeastern University in Boston and followed her dreams of working in the media. She moved back to New York and everything seemed to be falling in place. She had a job in radio she loved and even found a new passion as a licensed esthetician to supplement her media work. Her life was progressing as she’d always planned it would. Then 2008 hit. As the country was going through the economic crisis, Diana was not immune to its effects. First, she lost her radio job, which was her biggest source of income. This was only the start of a domino effect. Shortly after, she lost her job as an esthetician and decided to sell her car to see if that could hold her over, but it only carried her so far. Then the day came that she could no longer keep up with her rent and other essential expenses causing her to turn to couch surfing with family members. Her sister and brother, who continue to be her cheerleaders every day, offered for her to stay for a little while, but living so far out of the city increased the difficulty for Diana in finding sustainable work. Eventually she found herself back in the city and living with an aunt that she’d always had a close relationship with. For a while this worked out pretty well and Diana was able to pick up a few jobs here and there, however Diana still felt she was in a period of instability and was still trying to make her way back to her passions. After a few months, her aunt, who was an elderly woman, passed away. This sent Diana on an emotional spiral. She felt like nothing could go right and that everything she touched went wrong. At the time, she had a job on Wall Street and as she was watching everyone walk past her; she felt hopeless, “I felt like the most unproductive member of society.” To top this all off, Diana was again forced to resort to couch surfing in her housing instability… she felt like she had no direction or purpose. Looking for a lifeline, Diana decided to enter The Bowery Mission, a BoMF facility partner which was, without her knowing at the time, her first step in her Back on My Feet journey. Diana started to see women from the facility coming back in the early morning with great moods and ready to start their days before breakfast even began. When she learned they were out running in the early mornings, she felt she might as well give it a try since she’d been trying to be healthier anyways. Her original intention when joining was to get a workout in, “I wanted to incorporate physical health into my life again.” While this impact quickly showed itself to her, what she didn’t expect was the incredible teammates that welcomed her and the boost to her self-esteem that was soon to follow. 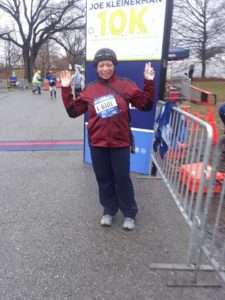 I’ve done a 6K, a 10K, and am training for a half marathon!” Diana realized she went from feeling as though she was on a directionless path, to practicing goal setting on a daily basis thanks to Back on My Feet. Even with these notable milestones already achieved, walking and running with Back on My Feet has motivated Diana to continue her goal setting and growth in 2019. “I have a radio spot on the weekends now and there are so many doors back into the media world I could open.” Reentering the world of one of her biggest passions, media, is high up on Diana’s list of goals for her future and now that she feels equipped to set expectations for herself, she is actually excited for the journey to reaching them. She no longer feels directionless, but in fact like the directions she could take are endless, as long as she takes each goal step by step. Diana is feeling great about her future, “I feel like now I can make a contribution to others somehow.” She thanks Back on My Feet for helping her get to this point. “Now I have an ‘I can’ mentality. This is a daily thing I think and say now after seeing what I was capable of.” If you had a chance to join Diana for a run, you’d feel that ‘I can’ attitude rub off on you as well. She is ready to take what comes next by storm. Diana continues to move forward and with Back on My Feet she recently applied for a position with the Marriott and is working through that application process. Thanks to her teammates and support from Back on My Feet, she is ready to keep taking positive steps forward towards her goals. Donate to support more members like Diana, come out for a morning run, or get involved in so many other ways!